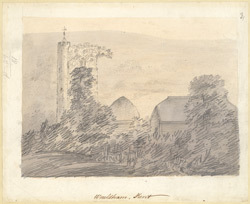 A watercolour and pencil drawing of All Saints Church of Wouldham in Kent. The church is low and not impressive from external appearances. However it has some unusual features. A late Saxon wall makes up part of the arcade between the south aisle and the nave. The foliage covered west tower dates from the 15th century and unusually stands to the north west of the nave. In this view the stair turret of the tower can be seen. The church also has the distinction of having the grave of Walter Burke, in whose arms Admiral Nelson died.